Home to Europe's only population of free-roaming primates as well as nearly 600 species of plants, Upper Rock Nature Reserve also serves as a staging post for thousands of migratory birds. Ride a cable car to the reserve or hike up a narrow road (which you'll share with light traffic). For a bigger challenge, climb the steps running up the east side of the Rock. Hiking or climbing will yield more diverse vistas and encounters with the monkeys in their natural habitat, instead of interacting with them in a large group of tourists. By using our Gibraltar trip itinerary site , you can arrange your visit to Upper Rock Nature Reserve and other attractions in Gibraltar. When you get to ' there is definitely some monkey that continuing the hike if they meet many others including puppies. However dedicated a few hours to see everything with tranquility, there are great views. Great views and it is fun to see the monkeys. Best to walk up in the morning when the paths are in the shade. The cafes and restaurant are quite good. The paths are wide and not too steep. Had fantastic weather and wasn't molested by the monkeys. That in itself made the visit worth it. Great view of the surrounding area. I swear I could almost see Morocco. Went on a Sunday and the town was pretty dead so I didn't have to deal with an overwhelming amount of other tourists. My experience may have been affected by the weather on the day - pouring with rain- but it was still an interesting trip. We are trying to travel cheaply so didn't pay the full price for visiting tunnels etc. We felt that a good walk around the reserve was what we needed. The rock cable car wasn't running on the day we visited which meant we were sharing the roads with an endless stream of taxis bringing people up from the town. It detracted from the experience. Especially the way the monkeys were used by the ones giving guided tours. They were given food to encourage them to ride on wing mirrors and car roofs for the entertainment of visitors. Sad to see animals being used for human amusement. The views from the rock are spectacular and well worth the hard uphill walk. The monkeys are really engaging. Babies completely irresistible! Loved our visit here, what a fantastic place, from the views to the apes we loved all of it. plenty of history for those interested, some from ww2 but also from when Gibraltar was a British colony in conflict with Spain. Lots of interesting plants some fantastic walks all of which involve hills. Will definitely visit again. Well worth a visit for the views and the monkeys. You can get the cable car all the way to the top of the rock and if feeling energetic you can walk all the way down. If you do walk down you will come to St. Michael's Cave which is worth a visit. A word of advise about the cheeky monkeys. Keep in mind that they are wild and you are in their environment. Keep an eye on your bags as a German tourist had her back pack opened by the monkeys, who proceed to steal all her food while emptying her bag. The monkeys roam wild and are friendly unless you provoke them. By warned!!. 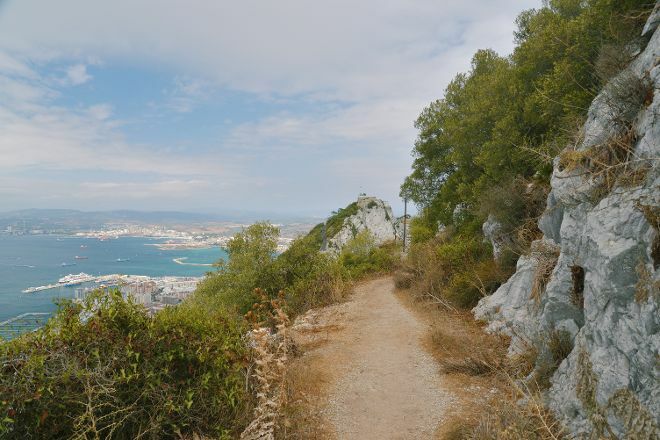 The views over Gibraltar, Spain and North Africa are spectacular and well worth the visit. There is a cafe offering good views and public restrooms. A number of viewing platforms to enjoy the views. Every day, we help thousands of travelers plan great vacations. Here are some tips on how to use your Listing Page to attract more travelers to your business - Upper Rock Nature Reserve. Promote your permanent link - https://www.inspirock.com/gibraltar/upper-rock-nature-reserve-a211862195 - on your website, your blog, and social media. When a traveler builds a plan from this page, the itinerary automatically includes Upper Rock Nature Reserve. This is a great way for travelers looking for a great vacation in your city or country to also experience Upper Rock Nature Reserve. Promoting your link also lets your audience know that you are featured on a rapidly growing travel site. In addition, the more this page is used, the more we will promote Upper Rock Nature Reserve to other Inspirock users. For best results, use the customized Trip Planning Widget for Upper Rock Nature Reserve on your website. It has all the advantages mentioned above, plus users to your site can conveniently access it directly on your site. Visitors to your site will appreciate you offering them help with planning their vacation. Setting this up takes just a few minutes - Click here for instructions.